The Oconee County Board of Commissioners is expected to vote tomorrow night to spend an additional $400,000 to build a sewer line to serve two future customers along McNutt Creek on the northern border of the county. The board put the decision on tomorrow night’s consent agenda at its meeting on July 27. That means the board will vote without further discussion unless one member asks that the item be removed from the consent agenda. The board will fund the sewage line largely from excess 2003 Special Purpose Local Option sales tax collections and interest on funds collected but not spent from the tax. The 2003 SPLOST is now expired and has been replaced by a 2009 SPLOST. The total cost of the sewage line project is expected to be $773,000, and the county received a grant from the Georgia Department of Community Affairs to cover $186,711 of that amount. To receive the Community Affairs grant, however, the county had to commit another $186,711. The board earlier voted to take this amount from SPLOST funds, meaning surplus SPLOST funds will cover $587,000, or three-quarters, of the total cost. When completed, the sewage line will provide service to Zoom Bait, a manufacturer of fishing lures, and St. Mary’s Highland Hills Retirement Village and its new adjoining Center for Alzheimer’s and Dementia Care. Both Zoom Bait and St. Mary’s are on Jennings Mill road. Zoom Bait now is on a septic system, while St. Mary’s sends its sewage to Athens-Clarke County for treatment. The sewage line will be gravity fed and follow McNutt Creek to an existing sewage pump station near Kohl’s. From there, the effluent will be pumped either to the Land Application System treatment facility on Rocky Branch road or to the Calls Creek Sewage Plant in Watkinsville. The county collected $631,000 beyond the projected $25 million from the 2003 SPLOST and also has earned and is earning money on unspent SPLOST dollars. At the July 27 BOC meeting, finance director Jeff Benko said all of the projects listed in the ballot language for the 2003 SPLOST were fully funded, so the board can do what it wants with the roughly $700,000 he identified as excess revenues as long as the board stays within the broad confines of the SPLOST language. That 2003 ballot initiative listed $6 million for water and sewage projects, $6 million for road, $5 million for recreation and cultural affairs, $4.6 million for county facilities, including the courthouse, $1.5 million for fire stations, $1.3 million for paying off debt on the jail, and $0.6 million for the emergency operations center. At the February town hall meeting, a number of individuals urged the county to find some funds for preservation of the area around the Elder Mill Bridge, but the Board said it had no money for that purpose. Even if 20 percent of the $700,000 had been set aside by the county for recreational and cultural affairs, it could have allocated $140,000 for Elder Mill or other park and recreation projects. The $5 million initial allocation was 20 percent of the $25 million total. But the excess funds are probably much higher than the $700,000 figure Benko used on July 27. In addition to the $631,266 more the county had taken in than it projected from the 2003 SPLOST, it had earned interest of $861,049 on the amount collected as of the end of January of 2010, I learned from an open records I filed earlier this year. That means the county earlier this year was sitting on at least $1,492,315 in unspent and unallocated money from the 2003 SPLOST. At the meeting on July 27, however, Benko said the excess funds were only $700,000. The board made its decision on July 27 to go forward with spending most of that money without soliciting or taking comments from the citizens present. Nothing on the agenda suggested that the board would be discussing how to spend the SPLOST excess funds. At the meeting, Oconee County Economic Development Director Rusty Haygood and Utility Department Director Chris Thomas made the request to the board for allocating the additional money to the sewer line project. Haygood told the Board that the initial estimates of the cost of the project had proven to be wrong. When the county asked the Georgia Department of Community Affairs to fund the project in June of 2008, the estimated total costs were $373,422. When the Department of Community Affairs awarded the grant in October of 2009, it said it would pay half that cost. The county put the project out for bids earlier this year and got a low bid of $640,000. Additional engineering, administrative and easement costs will bring the total figure to $773,000. When the new figure came in, the county asked the state if it would contribute more, and it declined, Haygood said. When St. Mary’s added the Alzheimers and dementia facility this year, “the circumstances surrounding the grant appeared to be favorable to get state assistance with the project,” Haygood said, resulting in a June 18, 2009, grant application. The money the county received is federal Housing and Urban Development funds passed through the state. 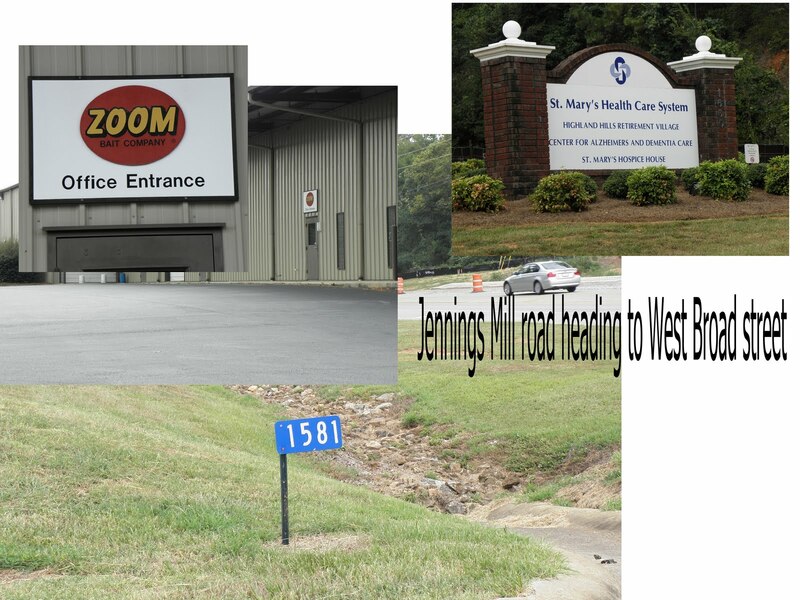 Zoom Bait, 1581 Jennings Mill road, sits just east of the existing Jennings Mill overpass of SR 10 and is hemmed in by SR Loop 10 and McNutt Creek. The plant has little room to expand its septic system, Haygood said when I talked to him by telephone on July 30. Zoom Bait manufactures soft plastic fishing lures at the facilty, which has no sign at its entrance and only a small sign over the entrance door. St. Mary’s, 1660 Jennings Mill road, had an agreement with Athens-Clarke County to treat the sewage from its retirement home, Haygood said. When it added the Alzheimers and dementia facility this year, Athens-Clarke agreed to take the additional sewage as well, but only on a temporary basis. Haygood said the Oconee sewage line is simply a way of helping a manufacturer and a health care facility that have been in the county a long time. The county doesn’t want either one to leave, he said. At the July 27 meeting, Haygood and Thomas were asked if there were any other likely customers who might use the sewage line once it is completed in the Spring of 2011. Haygood and Thomas said the existing line behind Kohl's will handle new developments. Haygood confirmed to me in the telephone call that the line really is for Zoom Bait and St. Mary’s. At the BOC meeting, Haygood was asked if he or Thomas had approached Zoom Bait or St. Mary’s and asked them if they would pay for the sewage line. Haygood and Thomas said they had not. Haygood said in our telephone conversation that he would do that only if instructed to do so by the board. Haygood said the new estimate is a high-end figure and is based on the assumption the construction will hit rock nearly the entire distance it will run. He said he is optimistic the project will come in under the estimate. “I hate it, but we don’t have much choice, do we?” Commissioner Jim Luke said before agreeing to put the additional funding on tomorrow night’s consent agenda.